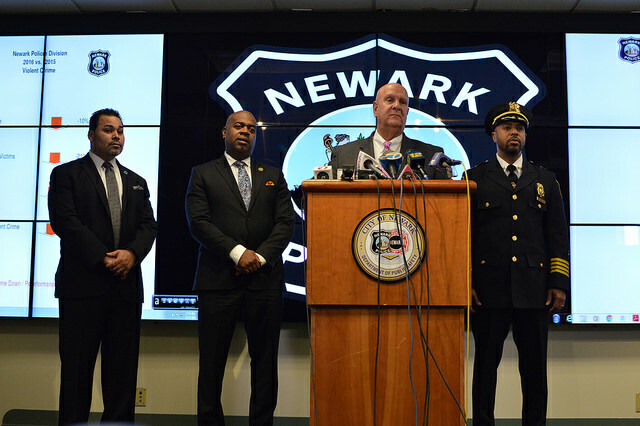 Mayor Ras J. Baraka and Public Safety Director Anthony F. Ambrose announced today that the city’s overall crime rate has declined when comparing 2016 to 2015 or any other year since 1967. When compared to last year, this amounts to nearly 1,300 fewer victims of crime, a 13 percent decrease, from 2015. Director Ambrose and Newark Police Chief Darnell Henry both acknowledged that they and Mayor Baraka couldn’t have done this alone. The most important element in achieving this reduction was the hardworking men and women of the Newark Police Division, whose tireless work and commitment are making Newark a safer, friendlier place to work, buy and live. “We also owe a special thanks to Colonel Rick Fuentes and the New Jersey State Police. Since January, they have been assisting the Newark Police Division’s efforts to make the city safer,” he continued. “We were also supported by the Essex County Prosecutor’s Office, the Essex County Sheriff’s Department, our Federal Law Enforcement partners, and through the assistance of United States Attorney Paul Fishman,” he added. “And, we would be remiss if we didn’t credit the work of our concerned community members who have helped us achieve these reductions through their increased support and cooperation in providing us with important crime information that leads to arrests, safer neighborhoods, and an enhanced quality of life,” Director Ambrose concluded.